Ash Wednesday is a weird day in New York. Because for really the first time during these blistery winter months, you actually look up and see people. Now, I know…that sounds bad. Like, what the heck? Who is this girl that she just goes around with her head in the clouds, not seeing people? But it’s true. In New York, people commute –read: walk— on a mission. Especially in the winter. You’re bundled up. Hunkered down. And you’re walking with purpose to get to where you need to go, as fast as possible, so you can get in out of the cold. Or when you’re on the subway — You listen to your ear phones, look straight ahead, and try not to get in anyone’s way. Ash Wednesday is a little different. Because of a smudge of ash on your forehead. Maybe it’s curiosity or nosiness, maybe it’s voyeurism, or perhaps a combination of all three, but I find myself looking at people. Really seeing them. Seeing their faces. And this really did something to my heart. It convicted me. I should be truly seeing people everyday. 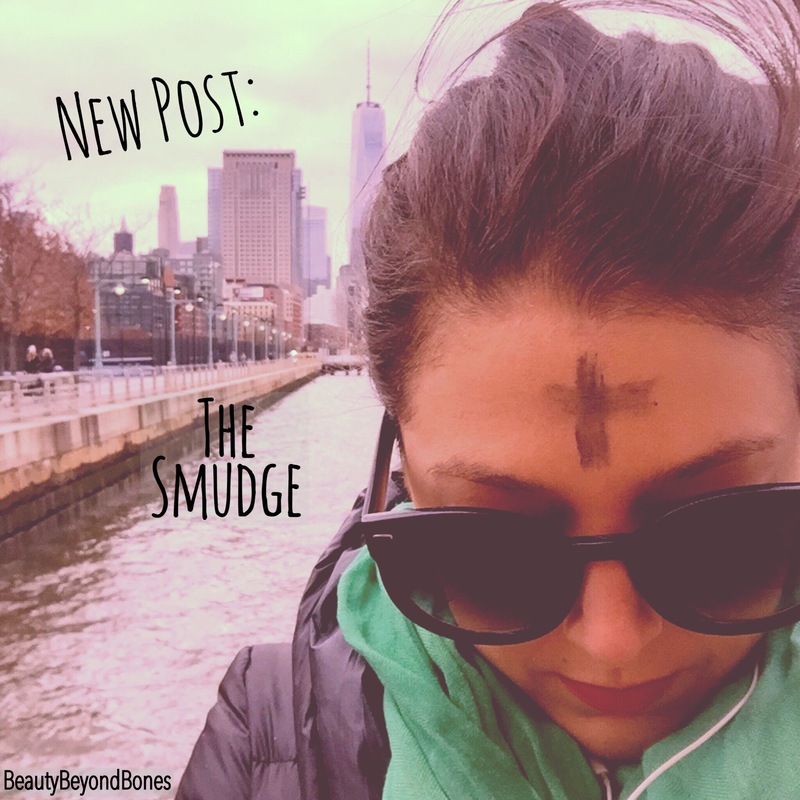 Yes, the ashes on your forehead mark whether or not you went to church that day…but here’s the truth: regardless of whether we have a silly smudge on our foreheads or not…we are all God’s creation. And each and every man, woman, child, elderly, business man on the subway, mother with three kids in tow, homeless man on the street, teenager at the mall — every single person has an inherent value and dignity simply because of that fact: that they were created by God. And regardless of a “smudge” or not — we are called to love each other. Show kindness. Compassion. Generosity. To everyone. We are called to see one another. Yesterday was really a wake up call for me. A realization that I need to look up, look into people eyes, and see the precious creation that is in front of me. Because his or her inherent human dignity demands it. To love my neighbor as I (am trying/learning) to love myself. Lastly, walking around yesterday and really seeing the people around me, it made me think about how I saw myself. I’ve been very open about my battle with the mirror – first: avoiding it at all costs because my self image reflected the pain my anorexia caused myself and others; and then finally (and more recently): growing to find the beauty inside. But the experience I had today in being intentional with how I looked at each person, reminded me that I need to do the same with myself. Really see the person looking back at me in the mirror. See her worth. Her dignity. Her beauty. Because it’s there. I’m just so accustomed to not look for it. But it’s there. He put it there. At the end of the day, it’s just a smudge of ash on our foreheads. And perhaps, I’m not focusing on the point that these ashes remind us that we once were dust, and to dust we shall return. A symbol of humility. A symbol of the full-circle-ness of life and faith. But this is what was put on my heart today. Help me to see each person in the compassionate and loving way that He sees each and every one of us: as His precious and beloved children, worthy of His sacrifice. Aw thanks girlie❤️❤️ glad you liked it! Hugs to you! Thank you for sharing your walk of faith and observations! You are inspirational! I wish women could see themselves through my eyes. You would see how amazingly beautiful you are, and how what you think are “imperfections”, are actually your uniqueness. You are amazingly wonderful, beautiful, and magnificent, just as God created you to be! Each and every one of you. This post is awesome. Ashes are always in style. Thanks Tony! I’d have to agree☺️☺️☺️ thanks for stopping by! Well I wrote a post today on music. However it looks weird. It’s got lines through half the blog. I will fix It tomorrow. You can look at it tomorrow. Actually, if you want to check it out, maybe it might help to give me advice on what best to do. Rather difficult for me to work on it because I am on my cell phone and I lack patience hahaha. The article is up. I dedicate it to you. When I wrote it I thought about linking one of your blogs just because you’re a fantastic writer. And even though I was a sports journalist you put my writing to shame. Breaking the glass ceiling is my next post. It’s like nothing I’ve ever written before. Its pretty outlook on my life that I did not expect to have. This is especially true the more I kept writing. The more I kept writing the more the story of evolved. In actuality if one person is affected by my writing when I’m done my job. My theory and estimation is you like my writing. So in essence if it so happens to be but you are the only one that likes my writing but I will continue to write because my writing somehow some way puts a smile on your face. Personally that is impact enough for me to keep going. Think on that thought for today. My friend I have a new blog post coming today that I thinking you might enjoy. The blogpost deals with the top Christian headlines from yesterday to today. The most important subject of how they differ and how they presented today compared to the days of the Bible in the days of Paul the Apostle after his conversion. Be enjoy always my friend you are worthy of being called a child of God. Never forget that you are worthy of being called a child of God. God loves you so much that he gives you bread on your table. He gives you a purpose to breathe that gives you purpose to love the unlovable he gives you purpose. Don’t look yet its hideous. Thank you so much. You’re right – seeing people – truly seeing them – is something I definitely have to work on too. Cuz it is so important. It’s the first step to loving people. Thanks for this great reflection! What an absolutely beautiful, heartwarming post, perfect for this day and every day. Yes, we should all look up at others, look into their eyes, smile and recognise that we are all part of the same world and universe. Thank you again. I loved this. It absolutely does. We need to remember this, everyday. 2016 is moving about quickly. The next chapter of my narrative has begun. I have forced my own hand which has caused time to morph. Is it standing still? Has it sped up? I’ve lost track of time entirely. I overlooked the fact that lent had begun. What sacrifice will I make? Well, what resolutions have I have I stuck to? It’s the change that I want to see–the person I want to be. Instead of continuously reflecting; instead of diminishing my own selfworth; instead of making it about me, I will value the relationship that I share with you. I thank God for you! When I see you, but especially when I don’t see you, I value you as God’s child. I will be less angry with the world. I will try harder to value each experience and perspective offered to me. I will practice being a better person. So when we see each other in passing in the street, at work, or in church, we will recognize God’s Love in each other. Today, I reblog this as an example of God’s Love working constantly in our lives. Thank you so much for the reblog, msktb! I appreciate it. Yes, may we all see god’s love in each and every one of us! Hugs! This was great. In I Cornthians 11 Paul warns us not only to see people but to care about them all. This is a great reminder of a mindset we should all be working on. Thank toy so much Joseph! What a great verse. Yes, we are to care for them all. Thanks for sharing that scripture! Hugs to you! Thanks for stopping by! Excellent. Insightful and a challenge to us all. God Bless you with all the amazing things you are in reminding us that we need to get our heads out of our gadgets and see the people in front of us for who they really are and not just what is on our little screen. How beautiful!! I know this is always a gloomy time in NY, weatherwise, as much as where I am as it is in NYC. But you just brought out a beauty of this time, that many forget!! Love it!! 🙂 Hugs!! Thank you so much Migueltio! ☺️☺️ yes, although our smart phones are links to the world, we can’t forget about the world in front of our noses! Thanks for this thoughtful reflection! Have a great evening! You too!! A great weekend ahead for you too. Beautiful picture. Beautiful post. During mass I sometimes get lost in a feeling of joy or awe. It’s a hard feeling to explain. Does this ever happen to you? Thank you so much Lynn! Mass is a beautiful time of reflection and prayer for me too. It does happen sometimes – especially during the songs ☺️ thanks for reading! Thanks Lizzy! Glad you stopped by☺️ have a lovely weekend! Hugs! Great blog! The photo of the pup all bundled up, is priceless! Haha thanks! Yeah I thought that pup was pretty cute😍 thanks for stopping by Richard! I loved this! No matter where we are, it seems we are all cut off from each other without realizing it. Lent is a great time to be intentional about community. Thanks Anna! Yes, community is so important for a lot of reasons. We were created for love and that’s at the core of a good community. Thanks for stopping by! Hugs! “We are called to see one another.” — golden! Hah I think so! Thanks Candice Marie:) I appreciate the encouraging words! Hugs and love to you! Oh thank you! Hugs and love to you as well! Such a wonderful post…and I’m so amazed that you are at this place at your tender age. This: “I should be truly seeing people everyday.” I’ve had that realization after facing trauma 21 months ago, and regret so much the many years I neglected caring, connecting and loving in an authentic way as I bustled about doing life…but not living life. KUDOS that you SEE. and HUGS. Amen! Lord open our eyes to see what You want us to see…to see everyone the way You see them. Hey John! Aw thanks so much☺️ I agree. It’s easy at church to see god’s fingerprints, but it’s a whole ‘nother ballgame out on the streets! I just pray to be given to eyeballs to recognize his creative genius-both in others as well as myself ☺️ thanks for stopping by and for your thoughtful response and wisdom, as per❤️ hope you have a great weekend John! Thanks so much! I’m glad you enjoyed it! Thanks for stopping by! Hugs! What a lovely post. Thank you for sharing. Blessed Lent. Hi myzania! So true. There so much beauty around us–but we can’t see it if we’re looking down. Thanks for stopping by! Hugs! Resonated on many levels. Thanks for giving us a peek into your heart. Nice reflection. Thank you Lonna! ☺️☺️☺️ glad you stopped by! Hope you have a wonderful weekend! Do you make your own quotes or you just Google it? Where on earth do you get all these awesome quotes? I’m thinking of creating a new blog with your inspiring quotes and I’m pretty sure that I will get instant hits (likes) and attract a lot of followers!! And not to mention good traffic too!!😄🙋🗽. (Yes even you can click the blue star like button). Is that your dog? 😂It looks really funny, small face with huge round eyes! lol!! Hi! Thank you! I’m glad you like my quote art:) I do make up most of the quotes. Not all-Some I get from other places, but a lot are mine. Thanks for the positive feedback:) I do make every single one of the quote art images though – it is quite labor intensive, but I guess it’s kinda like my gift to the readers. I don’t know..a weird way to think about it. But yeah. My only request is that if you do use or repost my images that you link back ☺️ just cuz they’re such a labor of love lol ❤️ but no, sadly that’s not my dog! That little fella I did find on Google 😂 have a great day my friend! Nailed it! Great thoughts and reflections! Aw thanks! I’m glad you enjoyed it. Thanks for reading! Hugs! Just thought you might be interested in at least breezing over the article he wrote in and around the same time you wrote the above! All the best to you w/blessings! Great insight. May each of us learn “to see” each other deeply as God sees. I tried to explain this to a minister once: the world crusts our beauty over with dirt. When we finally surrender in love to the Holy Spirit, we turn around to consider the life we left behind. Seeing the world as He sees it, through the connections to the pieces of all of us that are still whole and pure, our heart cries out in compassion for those still carrying the burdens that sin has placed upon them. Thank-you, dear ambassador for love. Always remember, dear one, that He is looking out through your eyes. An excellent read. I live in a quiet rural community where everyone smiles, waves and says “hello”. Your description of New York sounds so similar to the once or twice I go to Toronto a year for races, and it always made me sad to see so little interaction. Thank you so much Carl! And what a difference that is – even if small- very impactful. I’m originally from the Midwest, so when I first moved to the city, I’d be like nodding and smiling at people when I’d go out for a jog – and I quickly came to learn that people just don’t do that here. It’s really quite sad. Thanks for reading! Have a great day! I love your posts well done. I,m a prairie boy, I grew up in a town where you knew most everybody and you were expected to wave to and greet and acknowledge most everybody. What a shock to move to the city and be so ignored all the time. You are very beautiful, and what is most beautiful about you is your transparency. You are allowing yourself to be seen and not just the smudge on your forehead but the smudges on your soul as well, I deeply appreciate that transparency. It is what makes your posts so meaningful.. Thank You. Hey Jack. Wow I am so humbled and touched by your kindness. Thank you. Yes, moving here from the Midwest was definitely a change. But even though I may have had to “learn” NYC’s “interaction” etiquette, I’ve also learned a lot of other things too–beneficial things: independence, self-assurance, confidence, gratitude for relationships…it’s a double edged sword. Thanks for bringing a smile to my face this morning! Hugs! Thank you so much Nichole! I appreciate you taking the time to read and respond ❤️ have s lovely weekend! Hugs! Beautiful post and thanks for giving me something to think about. I may not live in NY (though I would love it for a while), I also can just go thru my day and not really “see” anyone either. Not see their pain or hurts or pay attention at all. Thanks again! I will keep my eyes open today! words can not express how much your words mean to me, how much you to me, I love your main photo for this post, you look so beautiful in it, I believe the first full photo i’ve seen of you, you are such an incredible, caring, kind, inspiring, beautiful human being, friend and sister <3 x. I miss our gasbagging (Long chats) :D. love the word smudge, it could be my nickname for you 😀 x.
Hi Benjamin, thank for such kind words. Truly. Thank you for being a great friend and supporter. It means the world. Sending big hugs! Beautifully written (as always)! I used to live in New York briefly and have spent many years in other cities, so I know what you mean by looking right past people on a regular basis. It wasn’t until I moved to the Midwest that I started looking people in the eyes and smiling. I think my recovery is increasing my capacity for empathy and my curiosity about others, seeing their humanity and dignity, but what you described about seeing my own dignity… Well, those words struck me, because I still shun the mirror and won’t pose for photographs. I’m not looking at myself that way. I focus so much of my prayer asking for help being less judgmental of others, but I don’t spend much time asking for help seeing myself with the COMPASSIONATE eyes of Christ (usually, I ask for help with seeing my faults more clearly). Thank you Lulu! Oh my gosh what a powerful reflection. I am clapping and giving you a standing ovation right now! You’re so right- we have to ask for Him to help us see ourselves with compassion. I definitely need to do that❤️ thanks for being such a great supporter and friend. Have a lovely weekend! Oh, thank you. I’m blushing. Have a wonderful weekend. I hope you find yourself with friends and family you love on Valentine’s Day and are able to take some time to treat yourself especially well and practice some self-love on Valentine’s Day. Hello, I love your message in this post and the positive messages in some of your accompanying posters which have spoken to my heart. Thank you for sharing your heart. Yet another awesome post! I love it. I do remember Ash Wednesdays in Miami. Kind of the same idea you describe here. I could curl up with a cup of tea and read through your posts all day (if I had the time of course…lol). But for now I will be grateful for what I can get…Thank you so much for your inspiriting posts. I love seeing how you touch so many people. Blessings. Oh thank you so much Joyfull Mom! Wow that’s so kind of you to say! Im glad you enjoy reading them. ☺️ sending so much love and hugs to you. Have a great weekend! Thank you so much! I appreciate you taking the time to read☺️ hugs! A true must-read! This is amazing! Great message here. We probably should be more intentional about noticing the people around us. Thank you so much Gene. I appreciate you taking the time to read. You’re right. Being intentional is the way to go! Thanks for stopping by! Beautiful post. We live in such a connected world but it’s like with that we’ve sort of lost our connection with each other, I was thinking this the other day on the train, everyone on the train was on phones, laptops or earphones in, no one on the train was speaking. I only noticed this because my phone battery had died! This Ash Wednesday I noticed fewer ‘smudges’ seems church life is slowly dying out over here. Hi Angela! Wow what great insight. You’re so right! Isn’t it almost eerie on the trains now?! NO ONE is even looking up! That’s a beautiful wish. I hope so too. That would be a glorious thing. Thanks for stopping by! Hugs and love to you! Aw thank you so much! Glad you enjoyed it. Thanks for taking the time to stop by! Hugs and love to you! Driving through back roads from Anderson to Asheville last Wednesday, I realized I would get to Asheville in time for the Wednesday Healing Service at 12:15 On my way, I drove through beautiful countryside: farms, meadows, ranches, lakes, woods, streams, waterfalls, mountains, and the towns of Six Mile, Pumpkintown, and Pickens…talking to Jesus and thanking the Father every mile. When I got to the church, the parking lot had more parked cars than usual for the Wednesday healing service. Entering the foyer, David, the sexton, greeted me with his usual “Hello, little buddy!” I asked, “David, where is the healing service?” seeing that the library was unoccupied. “Oh, they’re having Ash Wednesday in the sanctuary, today.” I was totally caught by surprise, but also totally blessed. Jesus was there, along with the Holy Spirit. Father Bob’s homily was amazing (my favorite and over-used word these days.) After the service, with smudge prominent, I asked Father Gary to lay his hand on my back and “heal me,” which was my original reason for being there. Without hesitation, Gary prayed for my healing. (I have been diagnosed with Carpel Tunnel Syndrome, Thoracic Outlet Syndrome, Cervical Spine Nerve Compression, and shoulder ‘instability’ which is probably rotator cuff stuff…all because of my moving, falling, falling while moving, and moving while falling.) The whole day was magical. I had to back out my entire groceries purchase because my daughter’s card was declined…the only money we have access to for the next two weeks…but even that provided opportunities to thank God. I am blessed and, as I read your inspired writings, I know you are blessed. Keep on writing, dear; you are doing ‘God work.’ By the way, my pain and symptoms are 85% less than they were before Ash Wednesday. To God be the Glory. Wow what an incredible, or –amazing 😉– story! Seriously though, that’s awesome and I’m so glad you had that experience. I don’t doubt it at all! God is totally capable of healing your CTS. Praise be to God. Thanks for sharing this beautiful reflection. And for your kind and heartfelt words of affirmation. It means a lot. Hugs and love to you! Great post. I think when we really start to see people, we begin to have compassion and then want to help others. A good thought for me, thanks. Love it! I used to live in my own dream world (head in the clouds) until I had my daughter. I find myself so focused on her reaction when we’re walking around our neighborhood or just out and about. She looks each person she sees in the face and says “Hi!” to them with the biggest and sweetest smile. I feel like her unconditional love for strangers has really opened me up to try and see them as she sees them: Children of God. Thanks for sharing!! Oh my gosh what a beautiful response! It sounds like we all could take a page from your daughter’s book! Aren’t kids just the sweetest? ☺️ thanks for stopping by! Hugs and love to you! Thx for encouraging us to be “intentional” and thx for your authenticity! Hey Pastor Brad! Thank you so much for your affirming words:) glad you stopped by! Have a great weekend! Blessings! To you too! I look forward to reading more from you! Keep it coming! Aw thank you so much Vero for these kind and affirming words! You’re right: we need to be careful not to make a snap judgement about a person, and really see them for who they are. Thanks again for reading! Hugs to you! Deep, very deep. Everyone matters but we are so caught up with ourselves. We really need to take out time and smile at that janitor, look at our parents or kids in the face when communicating. We really might not know what the next person is going through till we care enough to look them in the eyes. The face carry a whole lot of message. Thanks once again for the insight. What great perspective, Bito. Thanks for that. You’re so right- it’s a cliche saying but everyone is fighting a battle that we know nothing about. Thanks for taking the time to read and respond! Have a great rest of your weekend! Beautiful post…we all need to reflect on this idea of really seeing people as we go through our day. It’s not only a “big city” problem…I find myself doing the same thing in our small town, avoiding eye-contact, not wanting to engage with people. Thanks for reminding us to really see them. Thank you so much ☺️ you’re right-we all need to remember to truly see one another. Thanks for this thoughtful reflection. So glad you stopped by tonight! Hugs! Enjoyed reading this! Totally agree that God calls us to actually see the people we pass every day through his eyes, instead of just passing by without a second thought. God bless! Thanks Joel:) I agree. We’re all His kids and deserve to be given that dignity. Thanks for this great perspective! Have a great night! Yes! 🙂 We all do deserve that dignity because we are made in his image. I’d never want to disrespect the very image of God, which is us, humanity. Have a great night too! We live in a Selfie generation, our eyes ever on our own. Beyond just noticing others though, we miss so much beauty by keeping our faces pressed into screens and phones. God has made a beautiful world for us to enjoy, to take in. In all things, the God who gave us our senses cannot have intended for us to ignore them. The shallow existence provoked by our culture is not the call of the Christian. We need the depth that comes from cherishing every moment. Taste, don’t just eat. Smell, don’t just breathe. See, don’t just look. Listen, don’t just hear. Feel, don’t just touch. Live, don’t just exist. As for seeing others, it is impossible for us to love those we do not see. A doctor cannot heal the wound he or she does not see. That aside, joy is found in others. An old pastor once told me that the secret to joy is found in its acronym, J-O-Y. Jesus first, Others second, and Yourself last. Never once have I found him to have been wrong. Lovely post. Keep your head up and those eyes open. Wow what a truly beautiful and heartfelt reflection. Thank you for this incredible perspective. I want to give a standing ovation! You’re so right-JOY! we’ve gotta live it. Everyday. Because you’re right: God DID make this amazing world for his children to enjoy. Thanks for stopping by! Hugs and blessings to you! And thank you for finding my blog. I would not have found yours otherwise as I tend to just write and not read (and almost never comment). But I do make exceptions for exceptional individuals — and perhaps for the sake of some impassioned and odd theological ramblings. What a beautiful message! I can always count on your blog to be a place of inspiration. Thank you for putting this out there. This was really a wonderful post to read, and I enjoyed it very much. Thanks for sharing. It’s so easy to look through strangers and not see them. It’s frightening when you stop, think and then realise how little you know even of your neighbours lives. Sometimes, we don’t stare at others through fear. Some people act aggressively to the attention. I really loved this!! Being intentional about seeing people everyday and seeing their worth through God’s eyes and not our own! Lent is a beautiful time about realization. Aw thank you so much for this beautiful reflection! You’re so right. Lent gives us a time to slow down and remember what life is all about ❤️ thanks for stopping by! Thanks for this. It reminded me of a picture that was recently posted of me on FB and several people commented on how great I looked and all I could see was that my stomach looked pouched out and my teeth were crooked! I am 56 years old and still worried about all of that – thanks for this reminder to see myself through God’s eyes also! Great. Back here in Nigeria, especially the North where I live, Ash Wednesday is a day when people who have not been in the catholic church in ages to reacquaint themselves with their roots. I for one did not go to church this year but on getting to a store saw a lady with the Ash on her forehead and I felt so guilty. Nice one. Thank you BeautyBeyondBones. Thank you so much for this reflection. Wow Nigeria! How amazing. Sending lots of love from the USA! Thanks for stopping by! Love it! I distinctly remember moving from New England to a small WI suburb and being uncomfortable with the way people LOOKED at each other. Like they KNOW you! It’s hard to get used to, but oh, the things we miss in the journey! And is it that we don’t want to see them, or don’t want them to really see us?? Thanks so much Bobbi! I know what you mean! My family has roots in Wisconsin and so we vacation there a lot. And yeah, people look and … *gasp* TALK to eachother! Hehe thanks for your beautiful reflection. Lots of wisdom! Hugs! Well said. And keep hanging in there. God has so much more for you to see! Thank you so much! Yes, I do trust that He has good plans for me! Thanks for this encouragement! Hugs! Love love love this!!!! Beautiful reminder to all of us!!! Aw thank you! I’m so glad you enjoyed it:) have a beautiful day! Hugs! I agree about people not looking at each other in big cities In Portland, strangers engage each other on the streets, in restaurants, on the bus, etc. It makes Portland feel like a small town. An aside about Ash Wednesday, my teenage son had trouble with his car driving home after Ash Wednesday service. The police officer thought he was in a cult. There are few things that please God more than when we see–really see–others. I think you’re absolutely right 🙂 Thanks for this great thought. Glad you stopped by Mitch! hugs! Hi my awesome friend I know I can count on you for advice, I’m finding it really difficult complete blog posts, I have start 3 posts and I just can’t finish the what do I do😞 do I put them all into one post or should I leave them until they complete? Hey Benjamin! Hmm good question. I guess I always try to wait to publish until I’m really ready. I mean, I still have posts that I’ve written in my drafts folder that I just don’t think are quite there yet, so in waiting for more inspiration to strike. But that’s just me. Depends on what you want your blog to be? Softly and Turned up to Eleven. Thank you so much! ☺️☺️ turned up to 11 hehe😎 thanks for stopping by! ❤️❤️❤️ I look forward to reading more from you! That I may see people through the eyes of God. I pray that it lasts, its not easy. But when you want to build bridges, that’s the only way to live. Thank you so much! That really means a lot 🙂 hugs! Thank you so much Bill! I really appreciate it. Hugs! Oh, and it’s on my Facebook and Twitter accounts. I wanted to thank you for being my first and only like, but then I read a few of your posts; and I must say, I’m so sorry for what you’ve had to carry in this world. We all have our burdens to bear, but there is true power in the words of God. Not only power to heal you, but power to take away the “scars” that seem to have a chain around our hearts, weighing us down. I want t take that burden and carry it for you. You are very courageous for not giving up. Stay strong, and diligently seek the face of God. You have a beautiful heart; it’s very selfless of you to put yourself out there, that you might help to carry the burdens of others who struggle with ED. God bless you. Please feel free to come back to my blog, I can help you with your scars. Hi there, friend. Wow, thank you for such kind and encouraging words! You’ve made my heart so full this morning, so thank you. You’re right-there really is power and strength and peace in God’s word. I owe my life, literally, to Him. Thanks again for stopping by. I look forward to reading more from you! Hugs! I’ve never been to New York City, but I did notice that lack of seeing people in the subways and on the streets when I spent a month in France. That’s about the only thing I didn’t like about being there. In Congo a younger woman is wise to show discretion as looking a man straight in the eye is considered a come-on. No matter what the culture, however, looking for the inner beauty and person is always a win! I could never live in a city like NYC. I grew up in the San Francisco bay and loved it when I moved out to Idaho. Even living in Sacramento, ca was just constant grind of rude people. Out here, they are nice. I remember right after my dad died, I traveled north and spent three weeks with my mom–a cold, hard woman. leftover from my feelings of her much earlier in my life. And a really weird thing happened to me–I SAW my mother. That is the very word I used to describe what happened. I SAW my mother–and then, I fell in love with her for the first time in my whole life. Talk about strange–falling in love with my mother!! But that new insight I had into who she was as a person, not as my mom, but as a person, changed how I viewed and felt about her forever. From those days on, I continued to love my mother until she too died. BUT, not before each of us in the coming years had ample opportunity to share our love and even to verbally express it to one another. So grateful to the Lord to have had this opportunity before my mom died–Thank You, Lord. Did you catch that first line, BeautyBeyondtheBones? He has made everything beautiful in its time. I think your time has come! And God is using you marvelously. Keep up the great work. Beautiful pictures! I like this message. I appreciate the time you take in visiting me.